Their first prize shearling ram, home bred by a Karen Harrison ram, out of a Michael Dawson-bred ewe, was awarded the title at the society’s final major show of the season by judges Andrew Wright, the Skipton mart foreman, and up-and-coming young farmer Henry Fawcett, aged just 15, from Sedbergh, who was making his debut as a judge. The Haygarths received the Royston Baxter Trophy, presented in person by the former Skipton Auction Mart foreman, who lives locally in Steeton, before seeing their victor fall for a sale-topping 700gns, an exceptionally high price at the Skipton fixture. The buyer was Richard Brown, from Leyburn. 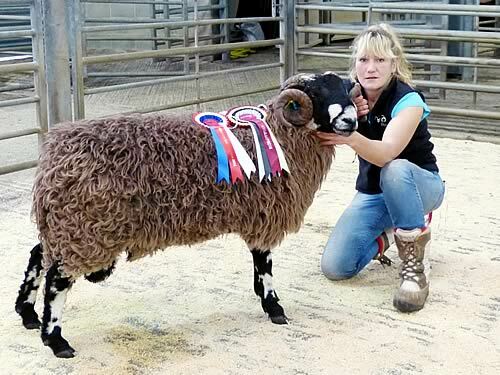 The Haygarths also sold another shearling ram, out of a home-bred ewe, to David Lambert, also from Leyburn, for 500gns. Other top prices included JH&JA Graham & Sons, of Lofthouse, who made 440gns on a non-prize-winning shearling by a Kevin Wilson ram bred from a Colin Price ewe, bought by JB&LJ Shirt, of Edale, while Michael and David Wilson, of Beckwithshaw – David is Dalesbred Sheep Breeders’ chairman - sold a shearling tup for 400gns to yet another Leyburn buyer, GN Clark. Josh Ryder, of Harrogate, stepped up with the reserve champion, the second prize shearling ram, got by a Michael Dawson sire, out of a John Bradley-bred ewe, which was sold for 300gns to Neil Jackson, of Horton-in-Ribblesdale, who in turn sold a shearling tup for 350gns to CM Faraday, of Tatterhorn Farm, Ingleton. Mr Faraday was himself awarded first prize in the aged rams class, his charge selling for 120gns, top price in class, with Robert Swainson, of Horton-in-Ribblesdale, selling his second prize aged ram for 110gns. Shearling rams averaged £173.05 per head overall and aged rams £81.90. There was 100 per cent clearance for the 31 rams in total. Show sponsors were Forum Animal Health, Carrs Billington, Dugdale Nutrition and Eden Farm Supplies.